In its purest form, heroin is an opiate-based relaxant that is derived from the resin of poppy plants. Unlike more refined morphine products that are used under very controlled circumstances in hospitals and medical environments, heroin is rarely delivered in pure form. It is an illegal substance that dealers and street vendors adulterate with other drugs and fillers before delivering it their victims. Heroin is sold in black tar, brown powder and white powder forms. Black tar heroin is the crudest form that includes several partially processed opiate derivatives. When black tar heroin is cut with lactose (i.e. milk sugar), the resulting product is brown tar heroin, White powder heroin is the purest form of the substance, but even that pure form will often include toxic adulterants and drugs that can create dangerous interactions with heroin’s opiate base. Dealers have been known to cut heroin with methamphetamines, sugars, and mild anaesthetics. Most dealers have little or no knowledge of the chemicals that are required to refine heroin from its poppy base, and they fail to refine processing chemicals such as battery acids and ammonia out of their final products. In some cases, strychnine and other poisonous residues have also been found in heroin. Medical morphine and heroin have the same powerful pain-killing effects, but the chemical form of heroin passes through the blood-brain barrier more quickly. The net effect of this is that a dose of heroin is approximately three times stronger than an equivalent dose of morphine. When this increased strength is added to the fact that heroin dosages are wholly uncontrolled, a user can easily overdose on heroin with only a single strong dose of the substance. Like all opiate substances, heroin is highly- and quickly-addictive. Heroin users rarely understand or appreciate the damage that heroin is causing to their brains and bodies. 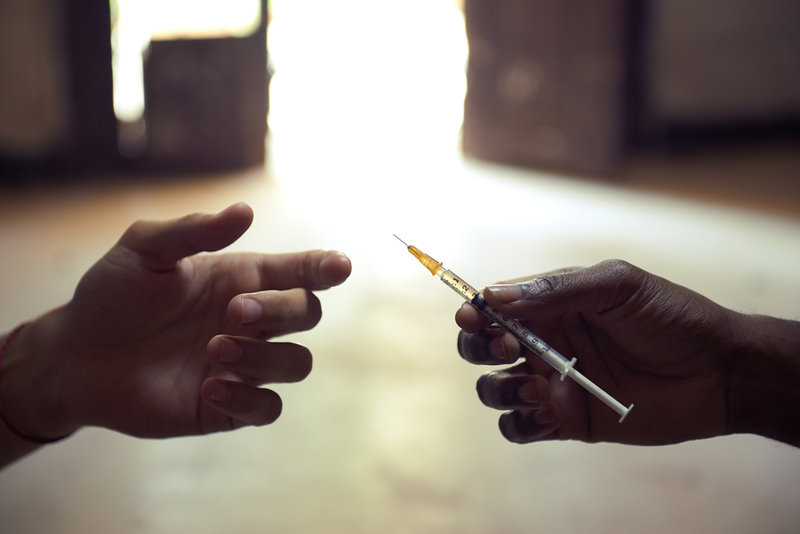 Many heroin addicts profess to be able to stop their heroin use at any time. Some try to use heroin only occasionally, but find that their occasional use degrades into regular daily use. Many heroin addicts fear the physical and psychological strains of withdrawal and opt to continue using heroin rather than suffer through withdrawal, notwithstanding the risks and dangers of that use. Heroin use and addiction has exploded in recent years as people turn to heroin to satisfy addictions and cravings that result from prescription opiate addiction, and as cheaper forms of heroin have flooded the United states market from Asia and South America. As heroin overdose risks have increased, emergency responders have begun to carry and utilize opioid antagonists such as Naloxone to combat those overdoses. Still, the better policy is for an addict to combat his or her heroin addiction before experiencing overdose problems. Recognizing addiction is the first step in that direction, but the addict will often refuse or reject all suggestions that he is addicted and his friends and family will often ignore obvious signs of addiction in favor of avoiding conflict and confrontation. If you have questions about heroin or about how it can affect your or a friend’s health, well-being and life, please contact the Hired Power staff and counselors at 800-910-9299. Heroin in all of its forms is dangerous and deadly. Ignoring a heroin problem will not make it disappear, and the professional assistance that we can provide will start a heroin user on the road to a healthy recovery.